This article is an account of a well known Filipino priest, Fr. Roberto Reyes, whom a rebel group claiming responsibility to the murder of Colonel Rolando Abadilla had approached nine years ago. They hand over to him Abadilla’s Omega watch as their evidence that they had killed him, not the five convicted accused. The court had accepted the watch but never considered Fr. Reyes’ testimony. AHRC. It was an unusual Christmas. No one knew about what I had carefully hidden in my room. A few days earlier, I had unusual visitors. Members of the communist hit squad Alex Boncayao Brigade or ABB came to my office at the Parish of the Holy Sacrifice, at the University of the Philippines, Diliman, Quezon City. It was more than a friendly visit. They had a request which was a matter of life and death, a matter of justice and the grave possibility of its miscarriage. This was indeed a sad and dangerous time in the Philippine justice and penal system. The death penalty had just been restored during the previous administration under President Fidel Ramos. The incumbent President, Joseph Estrada has been making open and fiery overtures about implementing capital punishment as soon as possible. Inmates on death row have begun feeling the torture of the fatal combination of presidential bravado and the blood lust of a growing pro-death penalty segment of the population. “Kailangang sampulan yang mga kriminal na yan (criminals have to be given a lesson through an example), was President Estrada’s oft repeated and heard comment those days. Everybody felt and knew that executions will take place quite soon. And those who knew, though in a different, scarier and more existential way were those on death row, which included the five men falsely accused for Colonel Rolando Abadilla’s murder. The meeting was over in less than an hour. The ABB men left and I sat in my office looking at this unusual object. I imagined what it would say, if it could speak. But it laid before me in dead stillness. It did not speak. It did not tell time. I don’t remember what time it read then but I do recall that it had stopped functioning. The hour hand and minute hand were frozen at some time in the past. It’s as though the watch had died with its owner as well. It was after all a dead man’s watch and worst, it was on his wrist when he was killed. I took the watch and wrapped it in paper and carefully hid it in a cabinet in my bedroom. Colonel Rolando Abadilla’s watch stayed with me, watched me and in a very real and active sense challenged me to think long and hard about the realities of the Philippine justice system. At that time, five men who were arrested, accused and later on convicted of a crime they did not commit have already spent more than three years in jail. They were convicted and have been sentenced to death, a punishment whose implementation was just a matter of time. I have been given the watch of a victim of so-called “revolutionary justice.” Now the watch began to talk to me. It did not approve of its owner’s extra-judicial execution by those who condemned him as an “enemy of the people”. It also did not accept the exploitation of five innocent men who have become fall guys in order to reduce or erase the stigma of a political crime and have it degraded to something less. If the watch could only speak and say more, I was ready to listen. In fact, I felt compelled to listen. The following days were busy. There was the “simbang gabi,” the nine days novena masses at dawn before Christmas. I was busy and tired those days but the watch was a quiet, abiding presence, a question crying for an answer. The watched laid buried under my clothes. It was virtually invisible but an almost perceptible presence kept me awake and attentive at all times. No, it was not only the Colonel’s watch which kept me company. It was not only the dead Colonel’s spirit. It was also the voices of the living innocent victims of a weak, defective, manipulated and controlled justice system. I would take out the watch from time to time and look at it. I would ask it about its diseased owner and what it knew about him. I invariably would remember the first words of a Latin phrase, “res clamat….” (a thing cries out for its owner). But the watch cries for something more. It cries for truth and justice. I am sure that if the watch had eyes, it definitely would have seen what happened and know exactly who killed its owner. And so, I would also ask the watch what it saw on June 13, 1996. How many men approached the Colonel’s car. How many had guns and pumped several bullets into the Colonel’s body. Testimonies of alleged witnesses seem at variance and even contradictory. The watch could not err because it was there. Yes, if only the watch could speak…if only. The nine days of novena masses went by. Christmas also came and went. No one knew that a dead man’s watch had kept me company. There were a few days of quiet and rest before the new year. There was time, more time to think, listen, pray and continue this unusual dialogue with a dead man’s watch. The new year, the new millennium came. The watch and I welcomed the festive noise of fire crackers and toy trumpets. What aside from the new year were we in fact welcoming? I looked forward to a year of truth and justice. I prayed for freedom and happiness for the unjustly accused and imprisoned. I know if the watch could only speak, the watch would also utter the same prayer and wish. Why on earth he had to bring in that song dumbfounded me. As to the Colonel’s watch, he ordered the court to take it and put it under lock and key. I surrendered the watch to the clerk of court who takes it with the usual bureaucratic nonchalance. I quietly said goodbye to the watch whose significance and message were once more about to be locked away in another judge’s prison of truth, bursting with un-used and un-accepted evidence. That was precisely how he called the watch, “inadmissible evidence.” Yet this inadmissible evidence has been taken for safe keeping in the sala of this judge, a judge who most certainly will just ignore it and treat it like he would the many pieces of inadmissible evidences now piling up in his cemetery of truth. I quietly said goodbye to the Colonel’s watch but made a promise. I promise to listen to the truth that it continues to communicate beyond the confines of its present prison. Here in Hong Kong, thousands of kilometers away from Judge Jaime Salazar’s court, I continue to talk and listen to the Colonel’s watch. No judge, no court could tell me to stop. No judge, no court can tell the Colonel’s watch to stop. In fact, no judge, no court can continually suppress the truth. There was more to the watch than the metal casing, the glass face, the springs and tiny screws, the numbers, hour hand and minute hand, the metal bracelet and the hidden gems that make Omega watches expensive. But this particular watch is priceless for it witnessed a truth that can set five innocent men free. These five have been in prison since 1996, twelve years to be exact. Also from where they are, they cry out the truth and clamor for justice. Funny, how a seemingly lifeless watch continues to speak in the same way that five living men do. The truth does incarnate itself in things and in human beings. A dead man’s watch is not just a thing. It was worn by that man wherever he went and whatever he did. It told him and others the time. I did not pay attention to the time on the Colonel’s watch. I just remember that it had stopped. Sadly, it also seems that the wheels of justice in the Philippines has begun to turn slowly, dangerously approaching a stand still. For many justice for the Abadilla 5 seems to have stopped. For the courts perhaps, it would have been a foregone conclusion. But there are those who continue to watch and act. There are the families of the Abadilla 5, their lawyers and friends. There are friends and supporters abroad. And I am still around after almost nine years of spending Christmas with a dead man’s watch. That was the last Christmas of the second millennium and the first year of the third . In those days of transition from the last thousand years to the next, a dead man’s watch and a priest sat in anxious and painful expectation of better things to come. Truth known whether to things or men is sometimes hostaged by something considerably less. Certainly, a lot of pride and amor proprio , fear combined with ambition, legal compromise and commercialized justice, political agenda and posturing and many obvious and less obvious forces are at work using institutions as bigger prisons to surround smaller prisons to further incarcerate the truth. (Fr. Roberto Reyes is a well known social and human rights activist who has a reputation as “the Running Priest” due to his undertaking runs to raise attention to issues. He has particularly undertaken these symbolic actions as protests against death sentence cases in the Philippines. He is a researcher with the Chinese University of Hong Kong. 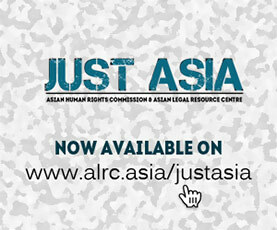 Now he is a staff member of the Asian Human Rights Commission).